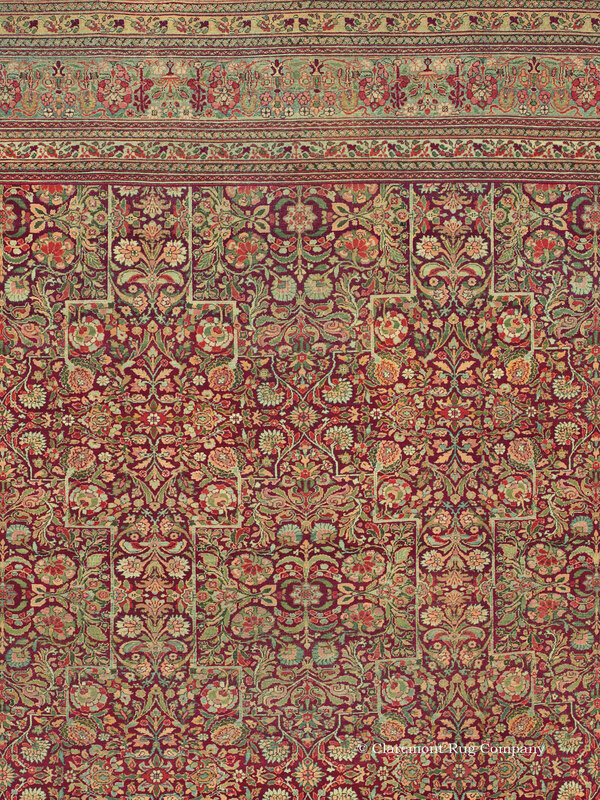 Search Our Inventory / All Rugs / 16&apos; 0" x 29&apos; 6"
16&apos; 0" x 29&apos; 6"
(High-Decorative) Walking across this palace size antique Oriental carpet is akin to meandering through an endless rose garden, so magnificent are its flower forms, so diverse and mesmerizing its colors. On an aged, rare oxblood-toned field framed by a glorious range of turquoise hues, all manner of greens, blues, yellows, and fruity reds convene in harmonious combinations. Undoubtedly a commissioned piece that took 4-5 years to weave, this monumental antique rug was deftly conceived to create an unfathomable splendor in a magnificent room, unifying all elements with its gracious overall design. Clearly woven under the direction of an accomplished design team, it boasts enrapturing artistry with new elements to discover wherever one stands. Happily this grand antique carpet is well preserved. We invite you to contact us for detailed information and further images.